Latvia proposes ban on Russian St. George’s ribbon | Russian Legal Information Agency (RAPSI). RIGA, May 7 (RAPSI) – Advisor to the Latvian Minister of Education and Science Didzis Senbergs has proposed prohibiting the use of Russia’s St. George’s ribbon in the country, according to his interview with the Latvian online newspaper Latvijas Avize. St. George’s ribbon is orange with three black stripes. It was approved as part of the Soviet Order of Glory introduced in 1943 and awarded for personal military valor. 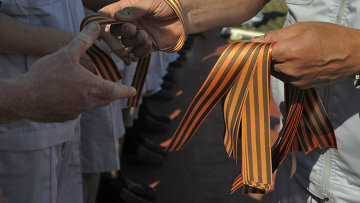 The ribbon was first freely distributed among and worn by civilians in Russia and other former Soviet republics in 2005 as an act of commemorating the victory over fascism in WWII. Earlier, Latvia imposed a ban on the use of Soviet symbols at public events. Symbols from the USSR, the Latvian SSR and Nazi Germany are not allowed at marches, protests and other political gatherings. The ban, however, does not cover celebrations, sports events or other entertainment. On May 5, Ukrainian MPs Oleksandr Mirnyi and Ihor Miroshnychenko from the nationalist Svoboda party also proposed prohibiting the use of Russian symbols, in particular St. George’s ribbon. Under the bill, the violation of the proposed ban should be regarded as “evidence of extremism and separatism” and punished as a crime. 14:01 07/05/2014 Advisor to the Latvian Minister of Education and Science Didzis Senbergs has proposed prohibiting the use of Russia’s St. George’s ribbon in the country.